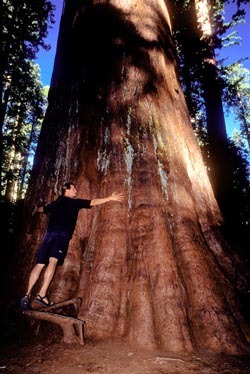 This beautiful park hosts 129 campsites tucked underneath some of the largest trees in the world, the Sierra redwoods. Campers have access to 6 picnic areas. Camping perk: Hundreds of miles of established trails. Goldstrike Village RV Park: San Andreas, (209) 754-3180. 45 campsites and 20 RV hookup lots available. There is a clubhouse for large groups, hiking trails, and community BBQ areas. Park perk: Olympic size swimming pool. Golden Pines RV Resort: Arnold, (209) 795-2820. The resort offers RV, tent and rental sites and is located about two miles east of Calaveras Big Trees State Park. Amenities include restrooms, showers, swimming pool, playground, recreation hall, and nature trail. Resort perk: laundry facilities. Tim Muetterties Realty, Arnold (800) 692-3444. A good directory if you are interested in mountain cabins, homes, lots, and acreage in the North Stanislaus area. The winter ski destination, Bear Valley is a great place to hang your river booties for the night. With fewer crowds in the springtime, you might even be able to negotiate a deal. Dunbar House B&B: Murphys, (209) 728-2897. The Dunbar House offers 5 lavish guest rooms with French and English antique decor from the 1880’s. Each room has a Norwegian fireplace, luxurious bed linens, and down comforters and pillows. Other amenities include TV, telephone, hair dryer, and herbal toiletries. Sate yourself before your river adventure, in the dining room or outside in the century-old garden, with an unusual and chic gourmet breakfast by candlelight. Dorrington Hotel B&B: Dorrington, (209) 795-5800. This historic B&B was once a stage coach stop. The hotel offers 5 cozy guest rooms and a private cabin. Guests can dine downstairs in Restaurant 1852. Hotel perk: One private cabin with stone fireplace and spa tub. Murphys Historic Hotel: Murphys, (209) 728-3444 or (800) 532-7684. Registered as a National Historic Landmark, the hotel was constructed in 1856 and offers 9 original guest rooms that are true to their “old-timey” origins and do not contain TV’s or phones. 20 modern rooms are also available adjacent to the hotel. The modern rooms still maintain the historic theme however they include television, phone, alarm clock, and coffeemaker. There is a full service restaurant on the grounds. Downtown Murphy’s theater and shops are also close to the hotel. Hotel perk: Historic ambiance, authentic period antiques. Timberline Lodge: Arnold, (209) 795-1053. Centrally located in Arnold, guests are close to nearby restaurants, wine tasting and other activities like cavern walks or hiking and biking trails. Affordable and charming, each room is uniquely decorated and includes a private bathroom, phone, television, and air conditioning. Some rooms have a freestanding gas fireplace. AAA approved. Gold Country Inn: Angels Camp, (209) 736-4611 or (800) 851-4944. Located on the original main street in Angels Camp. Rooms include various amenities such as HBO/Cable TV, Internet access, microwave, and refrigerator. AAA discount available. Inn perk: Pets welcome.